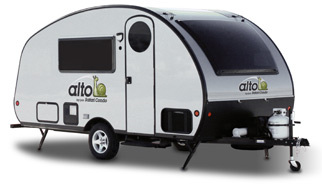 The Alto F-Series with the fixed roof delivers the craftsmanship and towability that you'd expect from an Alto travel trailer, with a little more space that the R-Series. 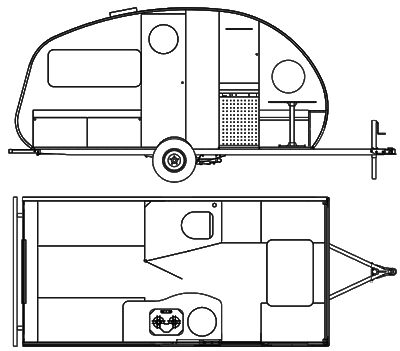 Three can sleep comfortably in the F1743, with a 60" X 81" king-size bed and a front dining area that converts to a 36" X 81" single bed. The separate, fully enclosed bathroom features a toilet and shower combination. The front room boasts a large window that fills your living area with space. And lots of cupboard space. The table can be moved to create two distinct dining areas : a two-seat and a five-seat dinette. Our Alto owners love their units. Call us today to arrange a tour and a test drive. Click the button to download F Series brochure.